It is that time of the year again. The New Zealand International Film Festival is over – at least in Auckland. I didn’t get to very many films this year. Work has kept me from gorging at the annual cinematic feast. I did bump into a friend in the lobby at one movie and she too had to cut down on her original fifty something movies in her first round of selection to just twenty eight. So, maybe it was one of those years when everyone had to make tough decisions. 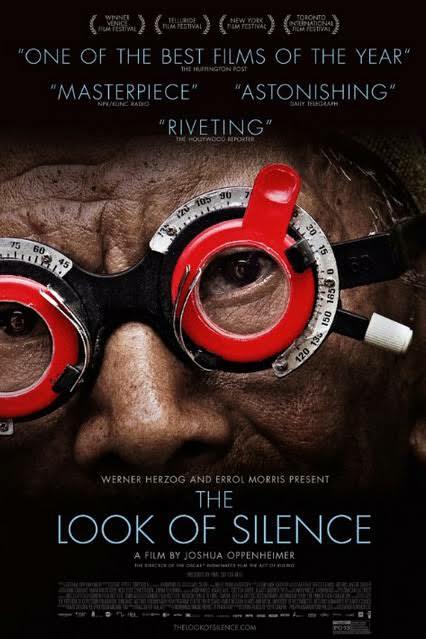 Nonetheless I shall go out on a limb and say that the best film of the festival (well, best film for me) was The Look of Silence directed by Joshua Oppenheimer. This is the companion piece to his earlier work The Art of Killing. Both these efforts are cinematic triumphs for the cinematography, the direction, everything. But they are triumphs of what Oppenheimer has called “the moral gaze” as they ask viewers to immerse themselves in the human dimensions of one of last century’s genocides. The films invite us to see the mass killings that occurred through the early 1960s in Indonesia. In The Art of Killing we see the events up close through the eyes of the Anwar Congo and Adi Zulkadry, two of leaders in the government sponsored death squads. This film is surreal and frightening in so many ways. (Not least is the fact that the U.S.A backed government of the 60s are still in power and the U.S.A itself refuses to acknowledge their part in the genocide!) One of the key issues we are confronted with is how such killers “write history” as Oppenheimer invites Adi and Anwar and their friends to make their own film of the killings with themselves staring as killers and the victims. We are invited to wonder how they make sense of what they have done and how they see themselves today. It is bizarre in the extreme and very haunting; so haunting that I had to go this year to The Look of Silence. The protagonists in The Look of Silence are Adi and his brother Ramli. Adi never knew his brother who was one of the estimated one million people killed by the government-backed killers, but Ramli is the constant silent and invisible presence looking on. Adi is an optometrist, which is the perfect filmic coincidence/ contrivance because it provides both an artful lens through which we see the killers and a cover for Adi to disarmingly ask the killers about what they have done. It is beautiful confrontation between mass murderers, who are only too happy to talk to the optometrist about every detail of the method and manner and the number of people they killed (and drinking the blood of their victims to stop them going crazy!). Except ‘confrontation’ is not quite the word because this is not revenge film. Adi is looking for some kind of truth and reconciliation with the killers of his brother and so many of his neighbours and countrymen and women. The film immerses the viewer into one of the hardest issues for the world and nations, namely, righting history. It is profound and not quite as gruelling as The Art of Killing (but it is still very tough stuff) because of the humanity of Adi and ultimately because of the humanity of Oppenheimer who holds us and does not simply consign the killers or the victims to a one dimensional stage. Dare I say, ‘this is a must see’ – at a cinema if you possibly can.